Per capita is the legal term for one of the ways that assets being transferred by your will can be distributed to the beneficiaries of your estate. Under a per capita distribution, each person named as beneficiary receives an equal share. However, the way your will is drawn up and the laws of the state where the will is probated may produce different results if one of those beneficiaries has died. For example, if you specify that your children inherit your estate per capita, in some states only those children who survive you would inherit. In other states your surviving children and the surviving descendants of your deceased children would receive equal shares. That could result in your estate being split among more heirs than if all your children outlive you. Per head; per person. The term is most often encountered in estate planning, where assets may be left to heirs, per capita. 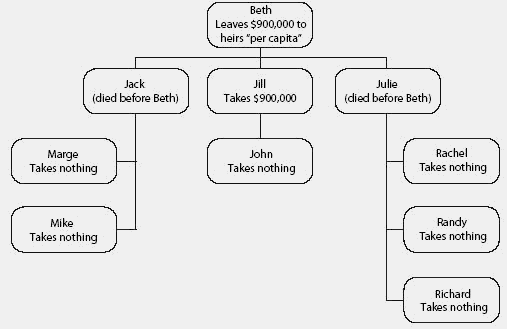 In a per capita distribution, a predeceased heir's portion is shared equally among other heirs at the same level. In lower MIT, the requirement for a country to be out of the lower middle income to upper middle income is that it should exceed the 28 year period and per capita income should grow at least at 4. Across the state, per capita income grew in all but one county last year, according to the new estimates. Overall, Tunisia ranked 89th globally, with per capita estimated at approximately $10,200 a year. The BETAM research focuses on the evolution of the main factors that contributed to this striking per capita income increase at the beginning and its abrupt stop at the end of the research period. GNI per capita (formerly GNP per capita) is the gross national income, converted to U. The disproportionate high per capita consumption of rice in the UAE could be due to the skewed income distribution. 8 years, and health care costs per capita were calculated at $2,426 (or approximately NIS 8,800). The highest level of GDP per capita in the EU27 was recorded in Luxembourg with a level of more than two and a half times the EU27 average. Government data shows that Bulgaria's Northwestern Region, the poorest in the EU, had a per capita GDP of BGN 5A 576, or 62% of Bulgaria's average, in 2009, while the Southwestern region including Sofia, had a per capita GDP of BGN 15A 610, three times more.